Bluewater Creek Polo Club (BCPC) located in Rogersville, Alabama, is one of the country’s best kept secrets. 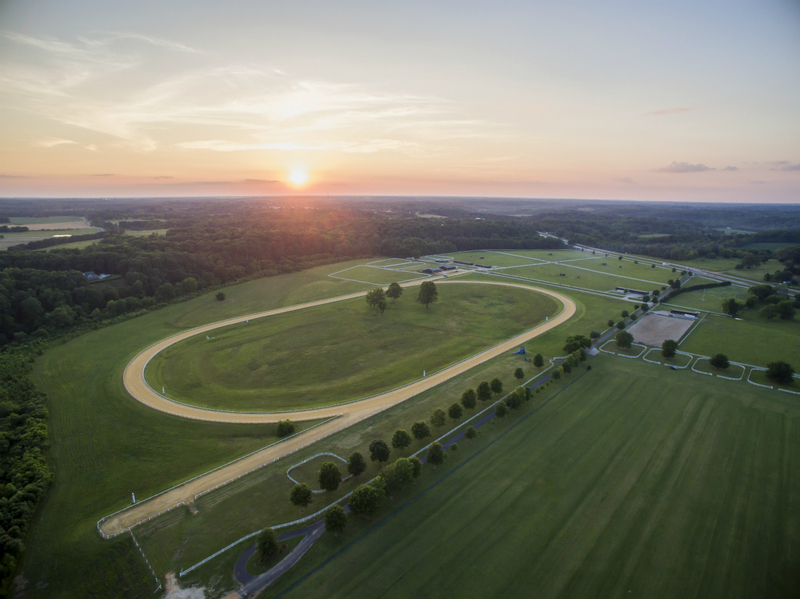 A short distance from Florence, Alabama, BCPC is perfectly positioned in the heart of the USPA Southeastern Circuit. Established in 1981, the club has consistently delivered almost four decades of friendly and family-oriented polo, boasting the Guinness Book of World Record’s oldest active polo player, Ed Robbins, BCPC founder and owner. At almost 86 years old, Robbins began his polo career in the late 70s and 80s. Inspired by his experiences in Palm Beach, Florida, Robbins enlisted in a 10-day polo clinic in Jackson Hole, Wyoming, taught by Polo Hall of Famer Billy Linfoot. According to the BCPC website, “The challenge, the extraordinary horses, and the thrill of the sport captured his attention, and soon Ed wondered how he could bring polo home to North Alabama…Bluewater Creek Polo Club started as a junkyard of buried cars and a network of fishing holes, an area that required a massive overhaul.” A statement that is hard to believe, considering the current breathtaking, spacious and verdant scenery of the club. 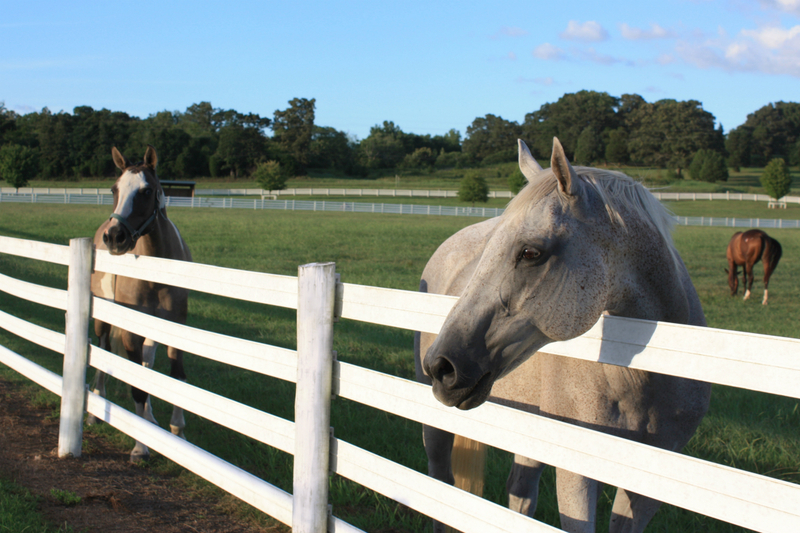 A truly unique place, the entire farm is enclosed with white Centaur fencing, a polyurethane fence with three strands of high-tensile wire – making it one of the safest polo clubs to visit in the country. “Those fences have been at the club since I have been going there thirty-two years ago,” said volunteer Interscholastic coach Cissie Snow. “All of the paddocks along the field, with the exception of about three, have been there for about thirty-something years.” A feat many a farm owner would agree is quite remarkable. Beautiful view of luschious paddocks with Centaur fencing. Photo by Sam Thigpen. 2015 Triple Crown winner American Pharaoh. The traditional summer season at BCPC runs from May through October. Aside from a local pool of club members, many players travel from as far as St. Louis, Missouri, and Tallahassee, Florida, to compete for the weekend. “The facilities are incredible for visiting teams,” stated Snow. “Everyone has paddocks, but they don’t join any fences, they are all secular. Each paddock has trees, some of them have little creeks, they all have water troughs and you can park your trailer right by them so they are very convenient. 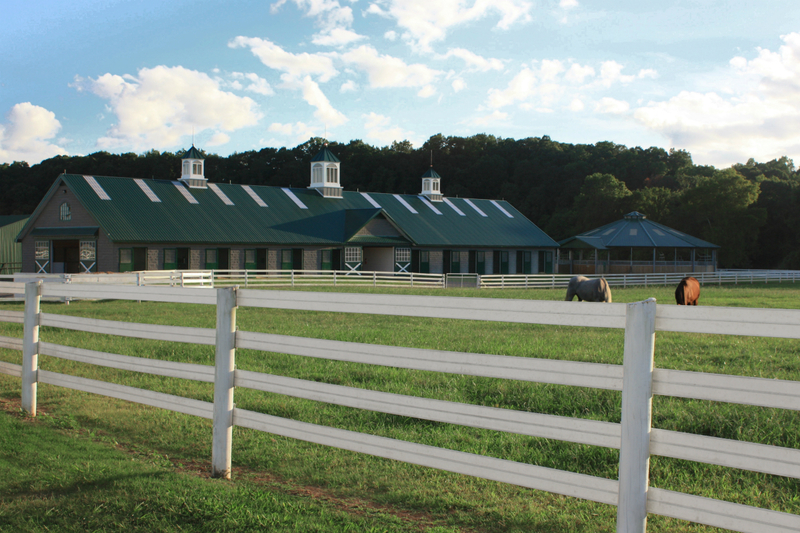 There are two shed row barns with big pastures associated that are also available.” The two exceptional polo fields can handle anywhere from 4- to 12-goal polo, however, the majority of competition is played at the 2- to 4-goal level. Bluewater Creek, the club’s namesake, is located at the foot of the polo field and while polo is the main attraction, the area is an ideal summer location offering recreational activities such as hiking, hunting and fishing. “We used to camp down by the creek and the horses would be right over there. You would get up in the morning and go take care of them, then get breakfast and come back and play,” reminisced Snow. Today, the creek is most frequented and enjoyed by their many youth members who take the horses for afternoon swims on hot summer days. 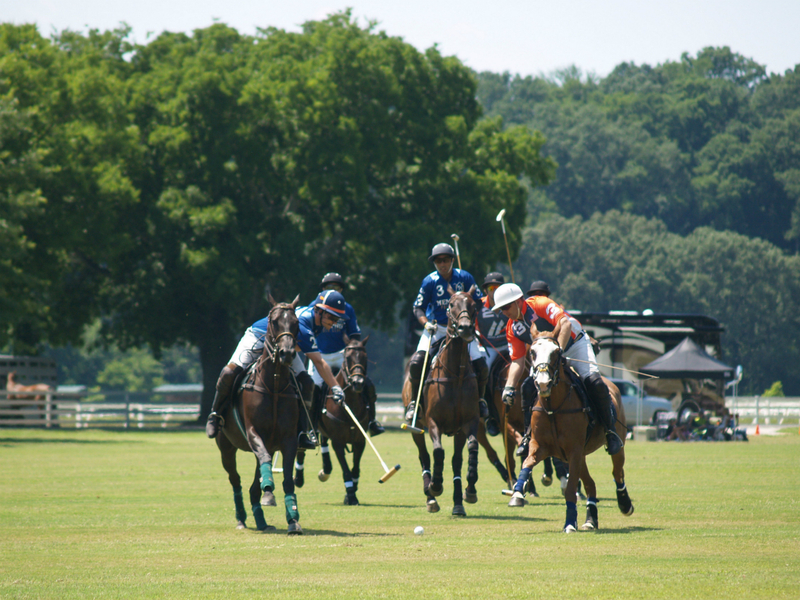 Bluewater Creek Polo Club is varied in the polo it can offer due to the incredible versatility of the fields, which can handle anywhere from 12- to 2-goal polo. The Bluewater Creek Polo Team takes on Work to Ride in their first official interscholastic tournament held at the Bluewater Creek arena in December 2016. A worthy investment in the sustainability of BCPC, the club has embraced the younger generation who now form a significant percentage of their membership. Add in coaching veteran extraordinaire Cissie Snow (past manager of the Polo Training Foundation’s Brushy Creek Polo Ranch in Burleson, Texas, where she coached numerous interscholastic/intercollegiate teams to national victories) to the mix of a burgeoning youth program and the sky is the limit. 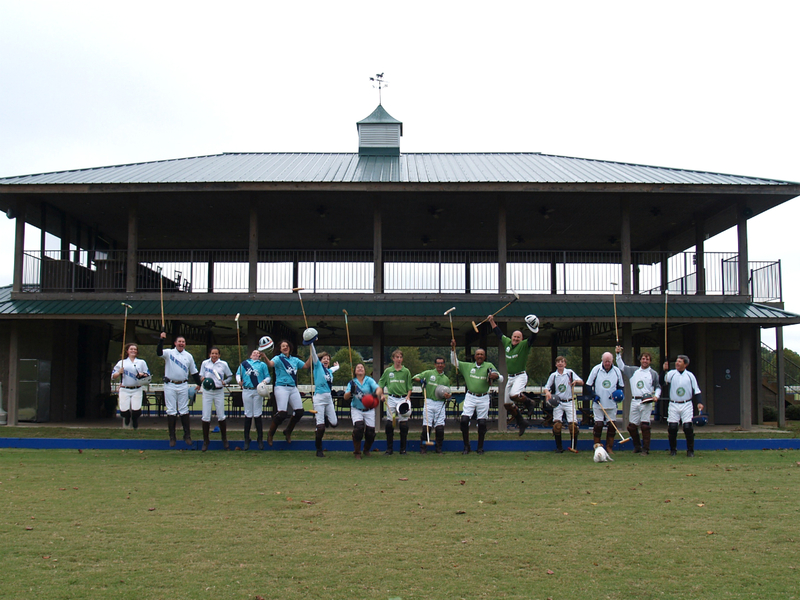 Bluewater Creek Polo Club Members exude their excitement for polo in front of the newly constructed pavilion with views of both fields. Last year, BCPC hosted their first NYTS qualifier in conjunction with a Farm-to-Table event on Memorial Day Weekend which raised an impressive $8,000. NYTS will appear on the agenda again, alongside three benefit matches and regularly scheduled games that are open to the public. A truly well-rounded club, BCPC also serves as a wedding venue with four already scheduled for the upcoming season. “My older daughter got married there,” beamed Walker. “My younger daughter Elizabeth plays, so we asked if they could go ahead and have practice that night. All of our guests were there for the rehearsal dinner and they really enjoyed watching polo.” A heartwarming anecdote that embodies the BCPC ideology of fun and family-oriented polo, geared toward youth in an enchanting setting. Gorgeous aerial view of Bluewater Creek Polo Club at sunset. 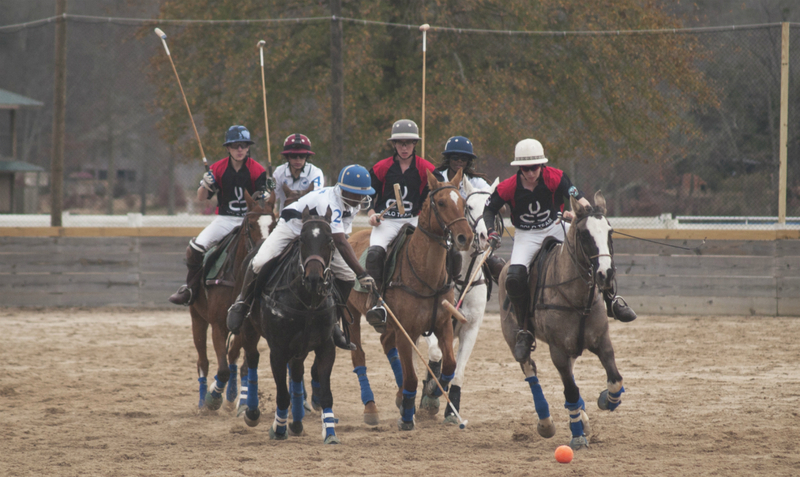 Bluewater Creek Polo Club is an exemplary polo club in the midst of a renaissance and an absolute cannot miss. For more information on Bluewater Creek Polo Club, visit BluewaterCreekPolo.com and “Like” them on Facebook for up-to-date schedules of tournaments and events. © 2017 PSpolo.com Inc. All Rights Reserved.